People often write journals not just to record the daily grind but to look back and understand various encounters, experiences and phenomena. Titled “Jet Lagged,” the latest exhibition at Arario Gallery’s Ryse Hotel branch is an exhibition that presents works of young artists striving to find their way in their cultural, historical and personal surroundings. Opened on July 19, “Jet Lagged” is a group exhibition featuring four Asian artists: Indonesian artist Jompet Kuswidananto, Chinese artist Zhu Xiangmin, and Korean artists Rae Sim and Baek Kyung-ho. Kuswidananto’s works take into account Indonesia’s social and historical contexts, particularly those that resulted from the long period of colonial rule and Gen. Suharto’s dictatorship, as well as the 2002 Bali bombings. “Power Unit,” an installation from 2015, is the artist’s attempt to capture the crowd. 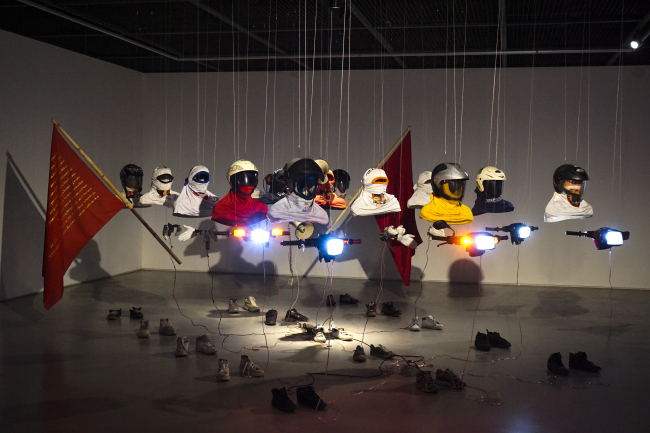 Hanging from the ceiling are empty busts decorated with motorcycle helmets and balaclavas fashioned from T-shirts. Also accompanying the busts are motorcycle headlamps, as well as clapping hands and megaphones that make dissonant sounds. Beneath the busts are worn-out shoes arranged in the same direction. Suharto’s resignation in 1998 was followed by many political movements that called for changes, the artist explained. 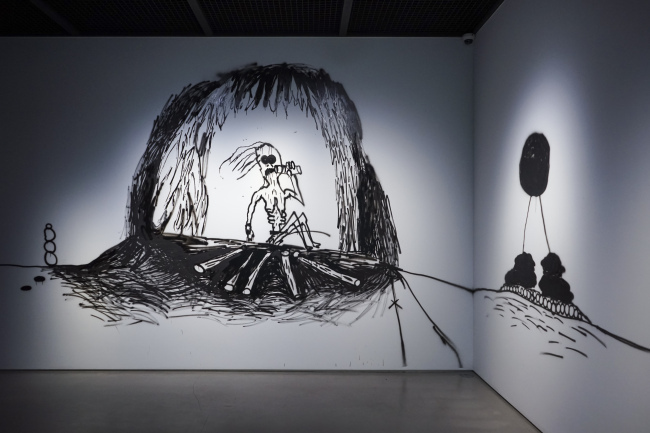 However, the exuberant movements fell short of improving people’s lives as they failed to become cohesive, the artist said of the political climate. Next to the Kuswidananto’s works are oil paintings by Xiangmin that focus on capturing the appearance and behavior of young people facing rapid political and economic changes in contemporary China. Tattooed boxers in rough strokes symbolize the emotional and psychological state of the young generation in ever-changing China. Baek presents paintings that have sculpture-like characteristics. The “Smile Figure” series uses circular canvases with personas hung above rectangular canvases, expanding the boundaries of the conventional four-sided canvas into a humanlike canvas collage. Sim’s paintings and video work are grouped under the title “Cannibal Kingdom: Psychic Detectives,” the third installment of the artist’s “Cannibal Kingdom.” Sim’s latest work revolves around a character named Monella, who became an ingredient for canned human in the previous installment, “Cannibal Kingdom: Production Factory.” Scenes supposedly seen through psychometry are depicted. “I somehow became interested in and fascinated by the notion of death. The ‘Cannibal Kingdom’ is a series of works started as I was delving into serial murders,” Sim said.